Scorn the witch. Fear the witch. Burn the witch.History is filled with stories of women accused of witchcraft, of fearsome girls with arcane knowledge. 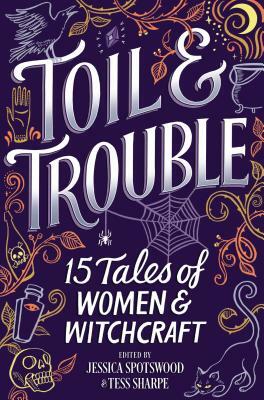 Toil & Trouble features fifteen stories of girls embracing their power, reclaiming their destinies and using their magic to create, to curse, to cure--and to kill.A young witch uses social media to connect with her astrology clients--and with a NASA-loving girl as cute as she is skeptical. A priestess of death investigates a ritualized murder. A bruja who cures lovesickness might need the remedy herself when she falls in love with an altar boy. A theater production is turned upside down by a visiting churel. In Reconstruction-era Texas, a water witch uses her magic to survive the soldiers who have invaded her desert oasis. And in the near future, a group of girls accused of witchcraft must find their collective power in order to destroy their captors.This collection reveals a universal truth: there's nothing more powerful than a teenage girl who believes in herself.